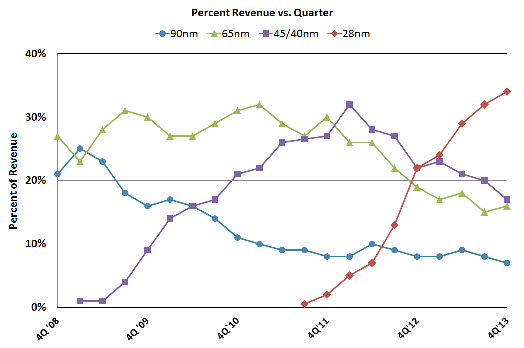 …but all eyes are on the 16nm finFET ramp and how that will play out across the industry. TSMC’s financial results for the 4th Quarter of 2013 and for the full year were announced just a few weeks ago, with TSMC stating it had again achieved record sales and profits. TSMC continues to own the 28nm foundry market. TSMC a year ago stated plans to have 20nm as its next technology node in production in 2014 and it looks to be delivering on this projected claim with the announcement that Fabs 12 and 14 have met 20nm SoC qual. C.C. Wei further stated that they were in high-volume production, even as they were speaking. Last year TSMC said that 28nm production was projected to be up another 3X in 2013 from 2012, and again it looks like TSMC delivered. Figure 1 shows a historical perspective of different technology nodes ramping as a percentage of wafer revenue at TSMC. At 34% of TSMC’s wafer revenue last quarter, 28nm has been a monster node for TSMC, especially when one also accounts for the massive growth in revenue during that same time period. There have been naysayers in the industry around 20nm, but TSMC has stuck with its story and is predicting an even faster first year ramp for 20nm than for 28nm. 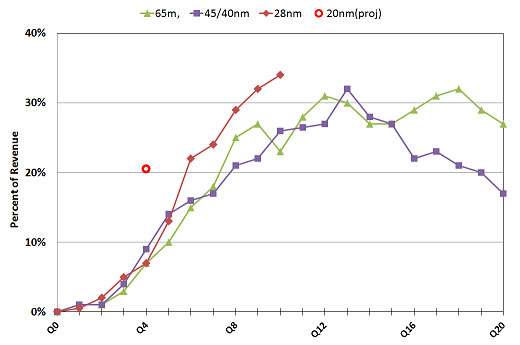 Figure 2 presents a side-by-side comparison of the percent revenue ramps at 65nm, 45/40nm, 28nm and where TSMC is projecting 20nm to be in the Q4 of this year. The ramp-up of 28nm has been very fast compared to other recent nodes and yet, there’s the Q4 projection for 20nm blowing them all away with a Q4 project of 20+% and 10% for the year. Meeting this projection would be an impressive achievement. The questioning at the conference call was quite lively at times, too. Chairman Chang and his staff felt that their upcoming technologies had been unfairly presented in comparisons by the competition. They took off their gloves and fought back with some claims of their own. Most notably, Mark Liu said that TSMC had achieved the risk production milestone of 16-FinFET in November 2013 and that an enhanced transistor version of 16-FinFET plus is in development, with a 15% performance improvement. He claimed it will be the highest performance technology among all available 16nm and 14nm technology in 2014, and that the above progress status is well ahead of Samsung. Liu also said, “More than 20 customer product tape-outs on 16 FinFET technology is (sic) scheduled this year already.” 2015 was mentioned as the year of the 16-FinFET battle in the marketplace, with 28nm and 20nm the real growth engines for revenue in 2014. As mobile products continue to increase in popularity the demand for smaller technology nodes still appears to be very strong. Table 1 shows a historic breakdown by segments. The biggest shift seems to be in consumer, which was explained as being the result of several new gaming consoles being launched in 2013.